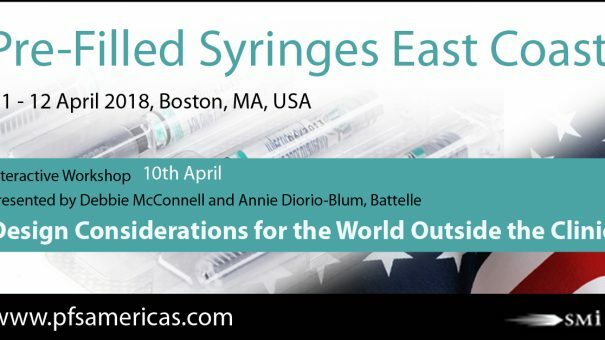 In the run up to the 5th Annual Pre-Filled Syringes East Coast Conference (11 – 12 April, Boston, US), SMi Group caught up with Debbie McConnell and Annie Diorio-Blum from Battelle to discuss common industry hurdles and opportunities within Pre-Filled Syringes. Debbie McConnell and Annie Diorio-Blum will be hosting an Interactive Workshop during the SMi’s Pre-Filled Syringes East Coast Conference: Design Considerations for the World Outside the Clinic – April 10th – where they will debunk key myths regarding what the PFS industry knows when it comes to user needs. An then provide participants with the insights and skills they need to collect user needs and convert them into design requirements using a methodical, repeatable approach. Another Workshop on April 10th – Human Factors for Connected Drug Delivery Systems – will be hosted by Cambridge Consultants. SMi Group works closely with our notable panel of speakers to build a programme tailored towards helping our attendees secure global success for their PFS device. This year at the Pre-Filled Syringes East Coast Conference you will hear exclusive talks surrounding PFS regulation, syringe filling of high-concentration monoclonal antibody formulations, combination product development, safety evaluation of leachables, implementing quality by design (QbD) principles, human factor studies, smart labelling solutions, digitally connected devices + much more!